As "Christians only," we claim "No Creed but Christ,"and "No Book but the Bible." Our rule for both faith and practice is God's inspired Word, the Holy Bible. We seek to follow God's simple plan of salvation as it is laid out in the pages of the New Testament. In regards to salvation, we believe that it is important to look at "the whole of Scripture," rather than focus on anyone verse or passage. Having said that, the following is a brief synopsis of our beliefs concerning God's Plan of Salvation. trusting in Him alone to get us to heaven. We must be willing to turn away from sin and toward God in REPENTANCE. We must CONFESS Jesus as Lord, the Christ and Son of the Living God. for the forgiveness of sin and the indwelling of the Holy Spirit. As a Christian, we are called to live a life of FAITHFULNESS to God. * God loves you and has a wonderful plan for your life. *However, you are sinful; therefore, separated from God. (sinful man) and Holy God. Jesus is the only way to God the Father. personal Lord and Savior. 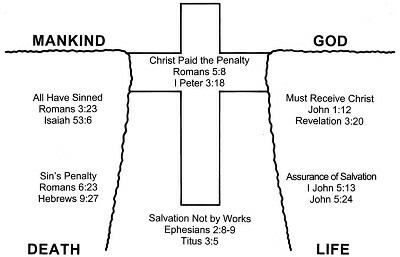 This done through faith, repentance, confession, and baptism.